Researchers at the Rosenstiel School are acquiring data on climate change by the minute and the day using remote sensing and in situ observations. Using satellite imaging and high frequency radar, scientists are tracking sea-level rise at multiple sites in the South Florida region, and examining imaging and models to assess the levels of warming from the world’s oceans from satellite altimetry. 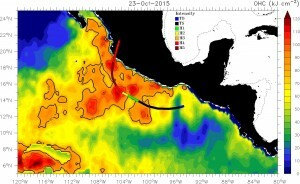 View the full high-resolution Ocean Heat Content (OHC) image . The University of Miami’s Rosenstiel School of Marine and Atmospheric Science has three high frequency radar monitoring stations—Crandon Park on Key Biscayne, Virginia Key, and John U. Lloyd Park on Dania Beach—and hopes to add a fourth station at Turkey Point in Biscayne Bay in the near future. “Sea-level rise is actually a direct result of wind-driven and tide-driven flows in the coastal ocean as well as the onshore meanders of the Florida Current,” says Lynn K. (Nick) Shay, professor in the Department of Ocean Sciences. “Radial and vector current measurements are made at 10 to 20 minute intervals, and we have been operating these multiple sites since 2003,” he says. Altimeter-derived ocean heat content image showing the interaction of Hurricane Patricia (track) with the warm ocean due to El Nino in the eastern Pacific Ocean in 2015. Rosenstiel School scientists use in-situ and space-based altimetry measurements to study important climate and weather characteristics. 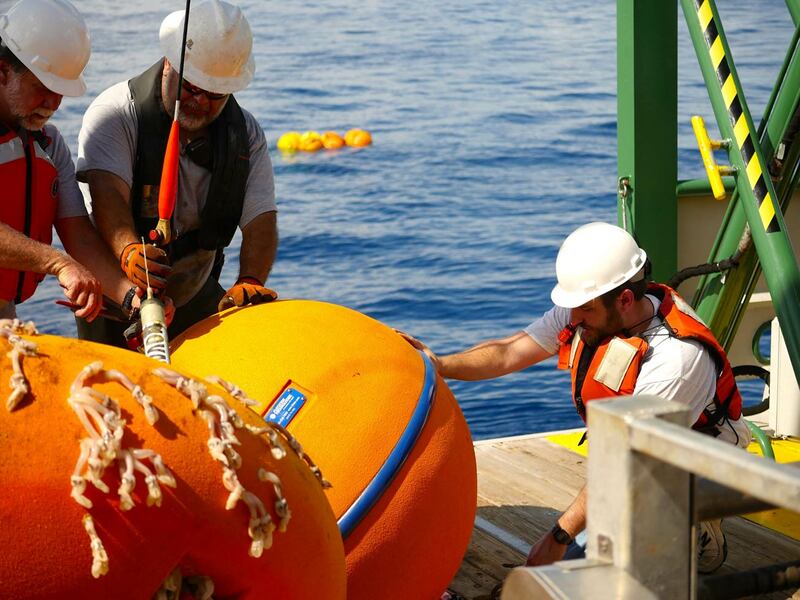 The sensing data provides information on currents and tides, and also helps examine the variability of the Florida Current in the Florida Straits. Shay’s team has also developed what is called an Ocean Heat Content product that uses daily satellite imaging to predict potential changes in hurricane intensity, which is now an operational product at NOAA's National Satellite and Information Service. The product, developed with federal funding, uses space-based altimetry measurements as well as in situ profiler measurements (including air-deployable floats and expendables) to also address the question of whether warm upper ocean layers are getting deeper on a warming planet, he adds. The product is operating in three ocean basins: North Atlantic, North Pacific, and South Pacific Oceans. Shay wants to add monitoring in the Indian Ocean to examine not only cyclone intensity change, but also to address global climate change and impacts of El Niño and La Niña.